Larry J. Sabato's Crystal Ball » What Does President Obama’s May Approval Rating Tell Us about His Reelection Chances? What Does President Obama’s May Approval Rating Tell Us about His Reelection Chances? There is little evidence about how indicators like satisfaction with the direction of the country or perceptions of the most important problem facing the nation affect the outcomes of presidential elections. However, there is strong evidence that an incumbent president’s approval rating, even several months before Election Day, has a strong relationship to the eventual outcome of the election. After examining the approval ratings in May of the election year for all incumbents who have run for a second term since 1964, the Gallup article noted that President Obama’s 47% approval rating is lower than that of all of the incumbents in this group who were reelected, including Lyndon Johnson, Richard Nixon, Ronald Reagan and George W. Bush, although it is only slightly lower than Bush’s 49% approval rating in May 2004. However, Gallup also noted that Obama’s May approval rating is higher than that of all of the incumbents in this group who were defeated: Gerald Ford, Jimmy Carter and George H.W. Bush. One problem with the Gallup analysis is that it leaves out two other postwar incumbents — Harry Truman and Dwight Eisenhower. Eisenhower’s 69% approval rating in May 1956 was the highest of any postwar incumbent except Lyndon Johnson in 1964, so it is hardly surprising that he was easily reelected. However, Harry Truman’s 39% approval rating in May 1948 was the lowest of any president seeking a second term, including the three who were defeated. Yet Truman, much to the surprise of many pollsters and political observers at the time, was reelected. So what conclusion should we draw from Obama’s 47% approval rating? Figure 1 displays a scatterplot of the relationship between the May approval ratings of the 10 incumbents seeking a second term since the end of World War II and the share of the major party vote that each of them received in November. 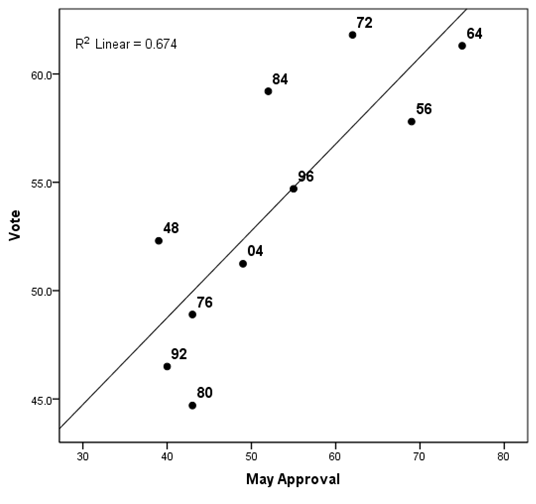 The data displayed here show that there is a fairly strong relationship between May approval and election outcomes. May approval explains about two-thirds of the variation in the incumbent’s share of the vote in November. Based on President Obama’s May approval rating of 47% and the prediction line shown in Figure 1, we would expect Mr. Obama to receive 51.6% of the major party vote in November. These results suggest that President Obama is currently a slight favorite to win a second term. 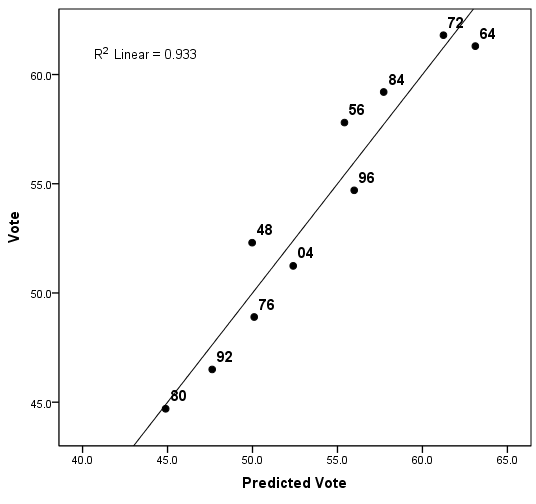 However, our ability to predict the November vote based on the incumbent’s May approval rating is limited, as evidenced from the fact that several of the points for individual elections in Figure 1 are well above or below the prediction line. Fortunately, my previous research shows that we can greatly improve the accuracy of our November forecast by including two additional predictors along with the incumbent’s approval rating: the growth rate of the economy during the first two quarters of the election year and the “time for change” factor, which indicates whether the incumbent’s party has held the White House for only one term or for two or more terms. Incumbents whose party has held the White House for two or more terms do significantly worse than those whose party has held the White House for only one term, even after taking into account the incumbent’s approval rating and the condition of the economy. The results displayed in Figure 2 show that a forecasting model including the change in real GDP during the first two quarters of the election year and the time for change factor along with the incumbent’s approval rating in May produces much more accurate predictions of the results of these 10 presidential elections. Despite the limited number of elections included in the analysis, the effects of all three predictors are statistically significant. We are now explaining over 90% of the variation in the incumbent’s share of the vote in November instead of only 67%, and all of the points representing individual elections in Figure 2 are very close to the prediction line. So what does our improved forecasting model indicate about President Obama’s chances of winning a second term in the White House? That depends of course on the growth rate of the economy during the first two quarters of the year. The government’s initial estimate of real GDP growth during the first quarter of 2012 was about 2%, and growth during the second quarter is expected to be similar. If we assume that real GDP will grow by 2% during the first half of 2012, the full forecasting model predicts that Obama will end up with 51% of the major party vote in November, not much different from what the simple approval-based model predicted.